It's taken a while to write this. The book is a corker (630 or so pages) and perhaps not one I should have started with. But hey ho, I managed it. It's the end of the nineteenth century. Olive and Humphrey Wellwood live with their children in Kent near the Romney Marsh. Theirs is a liberal, loving family life. Each child has their own distinct character. Each parent, their own secret. Their friends reflect the intellectual mileu of the time: the talented potter, the museum curator, the German puppeteer, and the anarchist. Olive is a successful children's writer, creating magical worlds of fairy tales with pixies, sprites and other fantastic characters. She also writes individual stories for each child: intensely personal tales that map their personality and journey through life. But all is not what it seems in this cosy world. Against a backdrop of intense debate around politics, class and equality, the lives of the family and their friends gradually unravel. When I first mentioned my plan to start the book a week in 2010 with The Children's Book, a fellow Twitterer said she found it to be, well, a bit like hard work. However, I buckled down and persevered. Now, after ninety pages a day for seven days, I see her point. It is indeed, at times, hard work. 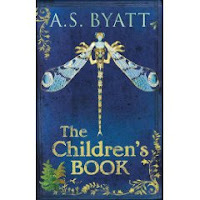 When Byatt zooms out from the minutiae of family life and considers the political, philosophical, artistic and ideological arguments of the time, it feels like a Monday morning class of Victorian history 101. There's no doubting her erudition or the research that has gone into the book. But it's a bit worthy, and frankly, at times a bit of a chore. The book is at its most powerful when she evokes the details of the Wellwood's life. When the children play in the treehouse; as the family gather for the annual Midsummer party; their adventures in Paris at the Universal Exhibition; visiting friends in Munich; and in the studio at the Fludd's house, where the pantry is full of difficult secrets. This is a book of two halves: half pleasure, half education. If I had not been on such a mission to finish, it might have taken several months. I'm glad I did persevere, but if you plan to read it any time soon, brace yourself: you may be in for a long haul.